VST MIDI Effect, a VST Plugin that can process MIDI. AU MIDI Effect, an AU Plugin that can process MIDI. 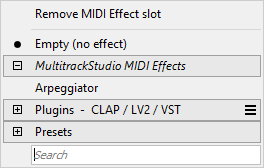 MIDI Effects are reached via MIDI Effect Slots. To add a MIDI Effect slot to a MIDI track, click the Instrument Slot's down arrow and then click the Add MIDI Effect slot option. Likewise, to remove a MIDI Effect slot click its down arrow and then click the Remove MIDI Effect slot option. A track can have only one MIDI effect slot. The data that appears in the track editor is sent to the MIDI effect. The MIDI effect processes the data and sends it to the MIDI instrument. A recording track records the data coming from your MIDI keyboard (ie. the MIDI effect isn't in the recording). A MIDI effect's 'hamburger' menu features an Apply to track option. This option applies the effect to the track, and engages the effect's Bypass button. If a MIDI track has multiple streams the MIDI effect will be applied to the first stream only.